Mike Napoli was born and raised in New York City. His love of the sea began at a young age. His father had a small yacht and Mike spent all his spare time on the water. Attending the State University of New York Maritime College (Fort Schuyler) was a natural choice. He received a Bachelor of Science degree in Marine Transportation at SUNY. His studies included Marine Engineering, Admiralty Law, Marine Insurance and Naval Architecture. After college, he worked in the Marine Insurance industry on Wall Street. The call of the sea was too strong. He changed his career and returned to the sea as a Master. After 32 years at sea, he decided it was time to come ashore and now serves as Yacht Manager at IYC. In this position, he enjoys dealing with the Owners, Captains and crew. Shipyard refit and shipyard contracts are his specialty. 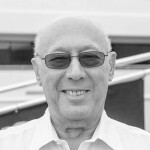 For the last two years he has also been in Italy as project manager of newly built yachts. He has held a Masters license for over 50 years.